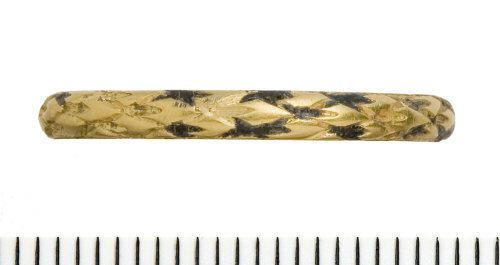 Decorative gold mourning ring. The outer surface is engraved with a fine trellis-style pattern, inlaid in dark blue-black enamel. In place of a bezel, there is a cartouche of white enamel. The inner face of the hoop is inscribed with the text: Prepared bee to follow me in italic script. The lettering retains slight traces of dark blue-black enamel. Internal hoop diameter 18mm; maximum band width 2.2mm; band thickness 1.2mm; weight 2.5g. The ring has not undergone any cleaning or conservation. Elemental analysis was undertaken by Mary Davis using a Bruker TRACER III-V Light Element Analyzer hand-held XRF, with a rhodium target, a voltage of 40kV and a beam current of 9.6μA. The readings were taken from a relatively dirt-free area of each blade, for 100 live seconds. The ring composition is therefore about 81% gold, 9% silver. 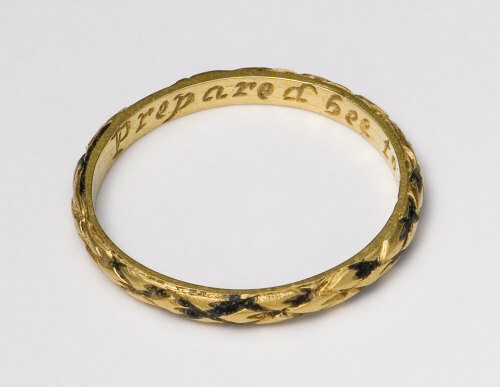 The style of the lettering and decoration, and form of the ring indicate that the ring is of late seventeenth- or eighteenth-century date. Similar letter forms occur on mid-seventeenth-century manuscripts (eg Henriette de Coligny, Le Triomphe de Amarillis [and other poems] (V&AM MS L1056-1950; Whalley 1980, 238), while similar letters 'e', 'u' , 'b' and 'd' are found on rings in the eighteenth century (eg Dame Joan Evans Collection, MoL 62.4/6; Murdoch 1991, no. 424). 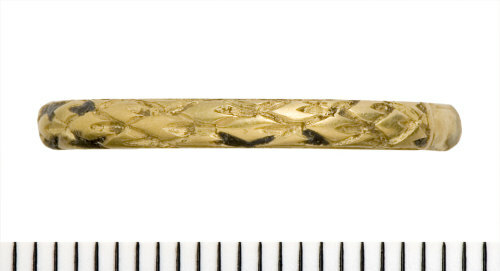 Rings with similar enamelled decoration have been found at Old Beaupre, Vale of Glamorgan (dated to the late 16th ot 17th century: Treasure Annual Report 2003, no. 420) and a site east of Colchester (with similar legend prepared be to follow me IK ob 4 1st 67 i.e. dated 1667: Treasure Annual Report 2004, no. 314). Such rings can be difficult to date, but the decoration and sentiment in this case suggest a seventeenth rather than eighteenth-century date. 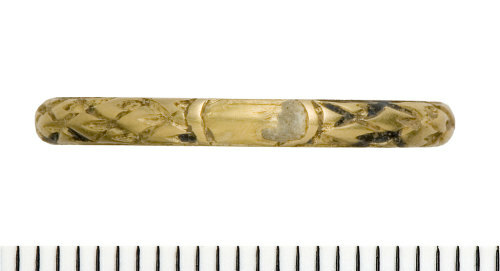 The double ee spelling occurs on a memorial ring engraved Wee part to meete dated 1658 (Dalton 1912, no. 1459). Other inscriptions attributed to the seventeenth century include A deare frend gift (Dalton 1912, no. 1483), In death shees blest Since heavens her rest (ibid, no. 1484), and Not lost but gone before' (ibid, no. 1485). Eighteenth-century commemorative inscriptions include 'Not lost but gone' (Oman 1930, no. 855), 'Forgive the wish that would have kept thee here' (ibid, no. 851), and 'Not lost but gone before' (ibid, no. 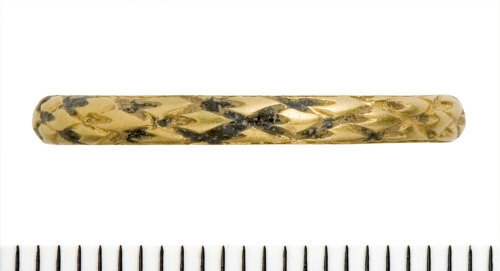 866).